Pesto is easy to make and easier to buy (where available) and helps create some super flavorful dishes. I use it on Passover and all-year round. It freezes well too. I like to freeze it in 1-cup serving sizes so I can whip it out and use it as a dip, marinade, or topping at any time. 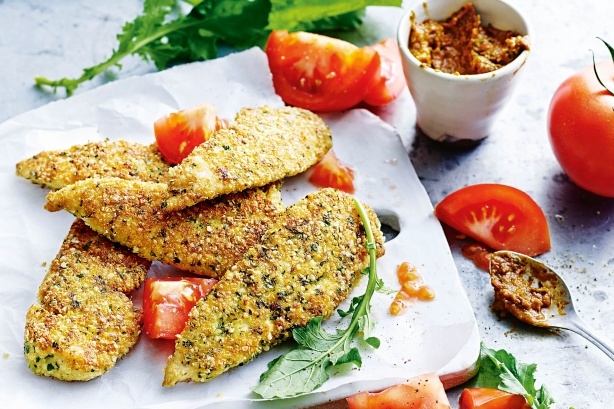 Pesto Grilled or Baked Chicken: Marinate chicken pieces, boneless breasts or thighs in pesto. Remove from marinade. If baking, place chicken in a roasting pan and bake in a 375 degree oven for approximately 60 minutes. 1. Pesto Roasted Potatoes: Preheat oven to 425 degrees. 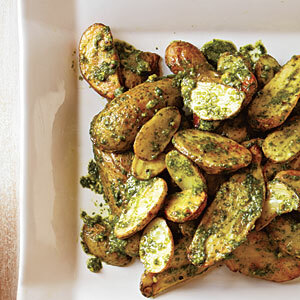 Toss baby red or yellow potatoes with pesto. Place in a low-sided roasting pan or baking sheet. Roast in oven for 45 – 60 minutes or until crispy and lightly browned and soft in the center. 2. 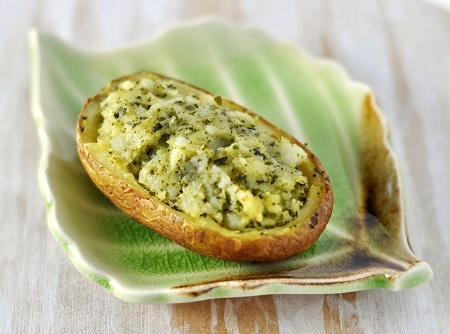 Pesto Twice Baked Potatoes or Sweet Potatoes: Bake potatoes or sweet potatoes in a 350 degree oven for 45 minutes. Remove potatoes and cut in half and scoop out flesh into a bowl, reserving skins. 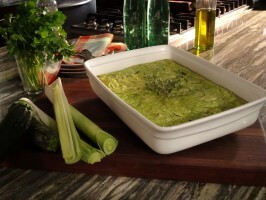 Mix flesh with 2 tablespoons margarine and about ¼ cup pesto (for 5 potatoes), mash and mix. Scoop seasoned potato flesh back into skins. Bake for an additional 10 – 15 minutes. For dairy, meal, top flesh with cheese and bake. 4. 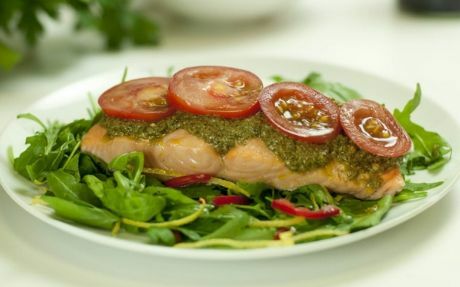 Pesto Baked Salmon: In a small bowl, mix ¼ cup pesto, with 3 tablespoons mayonnaise, 1 teaspoon Passover mustard (if you have it), and 1 teaspoon lemon juice. Place salmon in a baking dish (you can use pieces, steaks, or a whole side of salmon). Spread pesto mixture over the top of the salmon. Preheat oven to 400 degrees. Bake for 20 minutes. what can you use instead of the mayo in the salmon pesto? I’d use a white horseradish mixture, sour cream, cottage cheese, or a little less non-dairy creamer.